Today marks the one-year anniversary of the explosion of the BP Deepwater Horizon oil rig in the Gulf of Mexico. The explosion killed 11 men working on the rig and ultimately leaked five billion barrels (206 million gallons) of oil into the Gulf, making this oil spill 19 times larger than the Exxon Valdez spill. 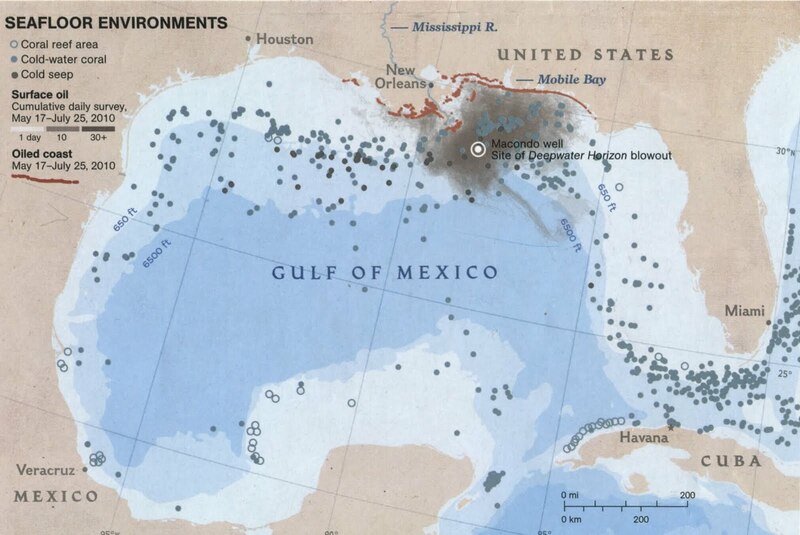 The National Geographic Society published a map about the Gulf of Mexico and the oil spill last year. The map, Gulf of Mexico: A Geography of Offshore Oil, shows the locations of oil platforms, wells, and pipelines on one side with information about the economy of oil in the Gulf of Mexico. The verso of the map is called The Gulf of Mexico: Layers of Life and depicts the rich habitats of “one of the most ecologically and economically productive bodies of water in the world.” Birds, animals, and marine life are shown in their coastal and marine ecosystems. The map shown above is a map of seafloor environments and marks the spread of oil along the coast up until July 25, 2010. This map is available for research and learning from the Ball State University Libraries GIS Research and Map Collection. The map circulates for two weeks or longer.